We’ve had a few unconventional weddings lately and here’s another unique couple who took a time-honoured tradition and did it their own way. Sydney scientist and academic, Tyler Troy, proposed to his girlfriend of seven years, Sophia Johnson, in a way that only a scientist can – through a telescope which beamed “Will you marry me?” up onto the moon. Well, not exactly, but tax consultant, Sophia, tells how her inventive husband made it happen. “It was a regular Friday night after work in August. We ordered takeout and the telescope was perennially on the veranda, so I didn’t expect a thing when he said the full moon looked amazing and that I should have a look. Tyler managed to put a tiny message inside the telescope, so that when I looked through it up at the moon, it looked like a message on the surface! It blew me away. 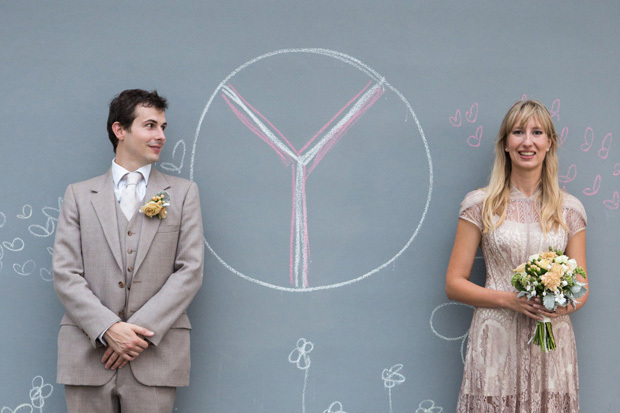 Around the same time, Tyler accepted a post-doctorate job in chemistry research in San Francisco and the pair, both 29, set out to plan two monumental life-projects at once – a wedding and a move overseas. “It was intense,” says Sophia. But there are only smiles, love and happiness to show in the photos of their relaxed, “hippy” park wedding and backyard cocktail reception. With only five days’ notice, Setsuka from Yuga Floral Designs created Sophia’s bridal bouquet. “Given the colour of the dress I needed a careful and inventive colour match,” says the bride. “I brought the dress in for the consultation and they did their magic to create a beautiful match.” Flowers included rusty-orange carnations, sahara and white mini spray roses, bouvardia, orange hypercium berries, green mulberry and dusty miller. Tyler wore a beige coloured suit which he found at Vinnie’s a year earlier. “It was clearly a great quality suit – pure wool and made in Italy. Tyler’s mum carefully took it in and adjusted it,” says Sophia. Back at their Glebe home, Sophia and Tyler celebrated with their 110 guests, with a cocktail menu by Portions Catering. Mixed hot-and-cold canapes were served – the coconut prawns were a favourite – as well as mini desserts such as brownies, lemon tarts and pecan pies. Later in the night, the couple’s neighbour arranged “an amazing little make-your-own BBQ roll buffet with amazing flavour combinations like beef with homemade tomato chutney, prawn with papaya salad and falafel with tahini,” says the bride. Photos courtesy of Infinity Photography.